Efforts to place Syria's chemical weapons under international control began in Geneva today with top US and Russian diplomats holding talks over Moscow's four-step formula to avert any military intervention, even as Russia's President Vladimir Putin issued a personal appeal to war-weary Americans over the looming crisis. North Korea appears to have restarted a reactor that produces plutonium, making good on threats to boost its stockpile of nuclear weapons, US analysts said. Gujarat Chief Minister Narendra Modi is coming to the US — via videolink. 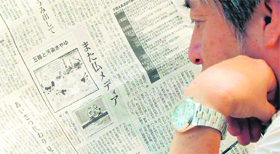 Angered over a French newspaper linking the nuclear crisis in Fukushima to the 2020 Summer Olympics here, the Japanese government plans to lodge a protest with France. The Pakistani military and Taliban militants exchanged prisoners on Wednesday as a confidence-building measure ahead of possible peace talks. Never before has a human-built spacecraft travelled so far. 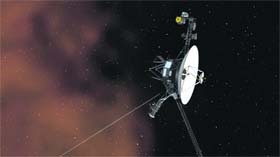 NASA's Voyager 1 probe has now left the solar system and is wandering the galaxy, US scientists said today. Talks in Geneva between US Secretary of State John Kerry and Russian Foreign Minister Sergey Lavrov on the four-step plan, which includes Syria joining the Organisation for the Prohibition of Chemical Weapons, will last till tomorrow, and could be extended to Saturday. The talks are meant to come up with a draft plan on how and when Syria will hand over its cache of chemical weapons. The plan, offered by Moscow earlier this week, is aimed at averting any US-led military strike against the embattled regime of Syrian President Bashar al-Assad, which the US holds responsible for killing 1,500 civilians in a chemical weapons attack outside Damascus on August 21. While Russia's Kommersant daily made public the details of the four-point plan for the first time today, an article written by Putin appeared simultaneously on The New York Times, in which he spoke "directly to the American people and their political leaders" on the Syrian issue. Putin - in the article 'A Plea for Caution From Russia' - warned the UN could suffer the same fate as its predecessor, the League of Nations, if "influential countries... take military action without Security Council authorisation". "The potential strike by the United States against Syria, despite strong opposition from many countries and major political and religious leaders, including the Pope, will result in more innocent victims and escalation, potentially spreading the conflict far beyond Syria's borders," he wrote. Satellite imagery taken on August 31 shows white steam coming out of a building next to the five-megawatt plutonium reactor at Yongbyon, the US-Korea Institute at Johns Hopkins University said yesterday. The image shows that North Korea "appears to have put the reactor into operation," researchers Nick Hansen and Jeffrey Lewis wrote on the institute's blog, 38 North. The reactor "is capable of producing 6 kg of plutonium a year that can be used by Pyongyang to slowly increase the size of its nuclear weapons stockpile," it said. North Korea had declared in April that it would restart all facilities at Yongbyon to "bolster the nuclear armed force both in quality and quantity." The pledge came at a period of high international tension over North Korea, which defiantly carried out a third nuclear test in February and threatened to attack the United States over its reaction. Tensions have since eased somewhat, but the United States has been sceptical of resuming talks with North Korea without proof that Kim Jong-Un's regime is committed to ending its nuclear programme. North Korea had shut down its Yongbyon reactor in July 2007 under a six-nation aid-for-disarmament deal and publicly knocked down its cooling tower to demonstrate its commitment. The reactor was the totalitarian state's sole way of producing plutonium, which it used to conduct its first two nuclear tests in 2006 and 2009. Modi will address the annual national convention of the Overseas Friends of the Bharatiya Janata Party in Tampa, Florida, via satellite on September 21. “Anyone who is interested in supporting the BJP and Narendra Modi is welcome to attend this important national meeting,” the Overseas Friends of the Bharatiya Janata Party said in a statement. Organisers of the event expect around 800 persons to attend the conference. Modi’s speech will be broadcast live across the US, to Canada, Europe and India. In March, the Wharton India Economic Forum’s decision to invite Modi to address its meeting via Skype sparked public outcry. The forum, an annual student-run conference hosted by the Wharton School of the University of Pennsylvania, was criticised by university faculty as well as students. The organisers were forced to rescind the invitation to Modi. Modi has been unable to travel to the US after the George W Bush administration barred him from receiving a US visa in 2005 following the 2002 Gujarat riot accusations which Modi denies. Some US lawmakers and international human rights organisations say these accusations have not been adequately investigated. The Obama administration has kept the ban in place, but its spokespersons have said it would consider Modi’s visa application, if he were to apply, to determine whether he qualifies for a visa in accordance with US immigration law. In November last year, 25 members of the US Congress — Democrats as well as Republicans — wrote to then Secretary of State Hillary Clinton urging her to keep the ban on Modi in place. Satirical weekly Le Canard Enchaine ran an article yesterday with two cartoons, one of which showed a sumo bout near a crippled nuclear power plant between a wrestler with three arms and another with three legs, with a reporter saying, "Marvellous! Thanks to Fukushima, sumo has been included among Olympic events." "The report was inappropriate. It is extremely regrettable," Chief Cabinet Secretary Yoshihide Suga told a press conference. He said the protest would be lodged with the weekly paper “Le Canard Enchaine” through the Japanese Embassy in France, Kyodo news agency reported. Those cartoons could "hurt the feelings of those affected by the disasters and convey misunderstanding about the toxic water problem" to the public, Suga said. On Saturday, Tokyo won a bid to host the 2020 Olympics. Another cartoon in the paper described a swimming pool with two people clad in protective gear and holding radiation testers nearby, with a title, "There is already a pool in Fukushima for the Olympics." The cartoons by the French paper followed a similar development last year involving a French TV programme. The military, however, denied the exchange which reportedly included six militants of the outlawed Tehreek-i-Taliban Pakistan (TTP) and two paramilitary Frontier Corps soldiers. The swap occurred in the Shawal area of South Waziristan Agency, the home of TTP chief Hakimullah Mehsud, according to the AP. The militants were subsequently taken to neighbouring North Waziristan Agency. Some intelligence officials also confirmed the exchange. They identified the freed Taliban as Sohail Khan, Ismail Khan, Ayaza, Prizada, Yakhya and Farman. They were arrested during the 2009 military operation, code-named Rah-e-Nejat, in the Mehsud area of South Waziristan. They were incarcerated in Bannu and Wana jails. In return, the Taliban handed over two FC troops, the intelligence officials said without disclosing their names. "This is the first time that humanity has been able to step outside of the cradle of the solar system to explore the larger galaxy," Marc Swisdak, an astrophysicist at the University of Maryland, told AFP. The precise position of Voyager has been fiercely debated in the past year, because scientists have not known exactly what it would look like when the spacecraft crossed the boundary of the solar system — and the tool on board that was meant to detect the change broke long ago. However, US space agency scientists now agree that Voyager is officially outside the protective bubble known as the heliosphere that extends at least 13 billion kilometers beyond all the planets in our solar system, and has entered a cold, dark region known as interstellar space. Their findings — which describe the conditions that show Voyager actually left the solar system in August 2012 — are published in the US journal Science.